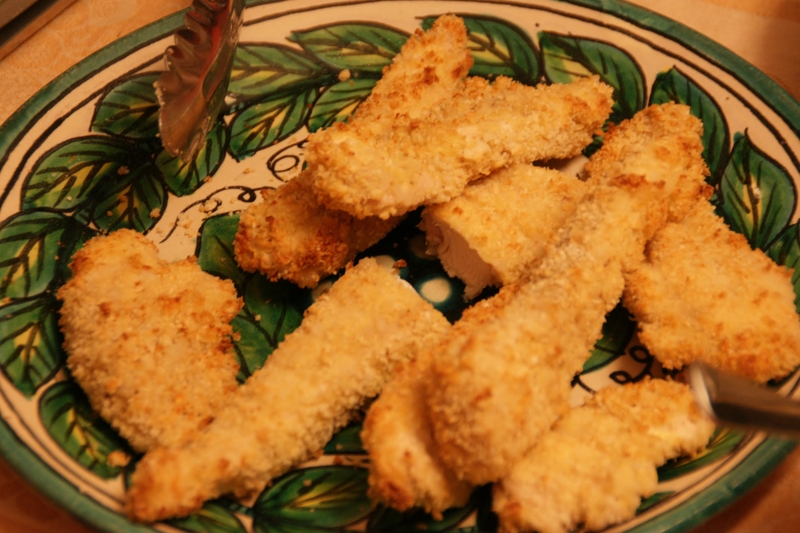 Oven-fried Chicken Strips– Fast Food With Less Fat! Today Ken and I went shopping, first to Michael’s so he could pick up some craft items (for God only knows what project), then to Wegman’s for a few groceries. As we were walking through the grocery aisles, I asked him what he wanted for dinner and he said, “How about oven fried chicken?” Wow. He didn’t pick one of his usual uber cheesy ‘n’ creamy casserole dishes; I’m wondering if he’s subconsciously picked up on my “we need to eat healthier” vibe. Yesterday, he was amazed when I said the chocolate chocolate chip cookies had less fat than regular chocolate chip cookies, so maybe he thinks not all “lighter” foods are bad. He definitely wants more chocolate angel food cake! This is a pretty basic dish and you prepare the meat just as if you were going to deep fry. 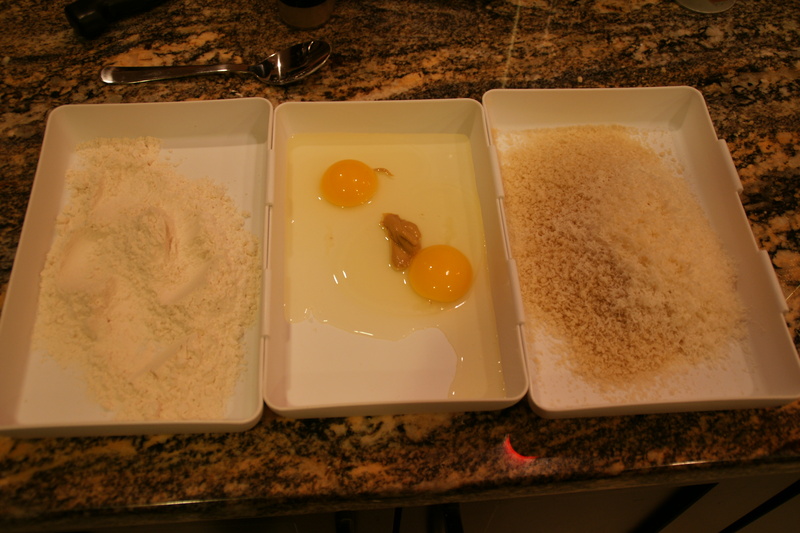 Three-part dredge: flour, egg, then bread crumbs. A bit messy, but quick– and no messing around with deep frying! I’m going to serve the strips with broccoli and whatever leftover starches we have. Maybe some of those test cookies or angel food cake for dessert (we can’t ever skip dessert in this home)! Preheat your oven to 475 degrees. Set a rack on top of a rimmed cookie sheet and spray with cooking spray or brush with olive oil. 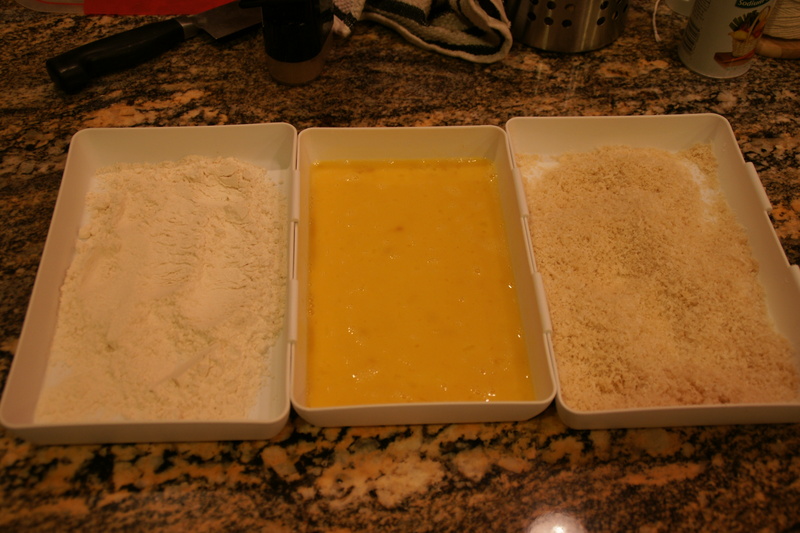 Set out three shallow pans or plates (I have a Pampered Chef set of dredging trays); fill the first with flour, the second with the eggs and the third with the panko and Parmesan. 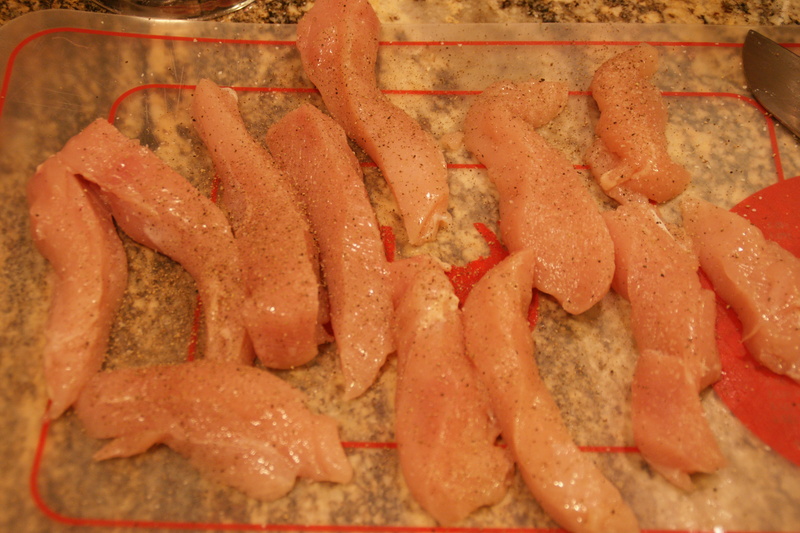 Cut the chicken breasts into tenders; I usually get three to four strips per breast. Salt and pepper the the strips on both sides. Cut these fairly thick– 2 to 3 inches so they don’t dry out! Mix the panko and cheese, and beat the eggs and mustard together. The mustard mixed with the egg adds a lot of flavor. 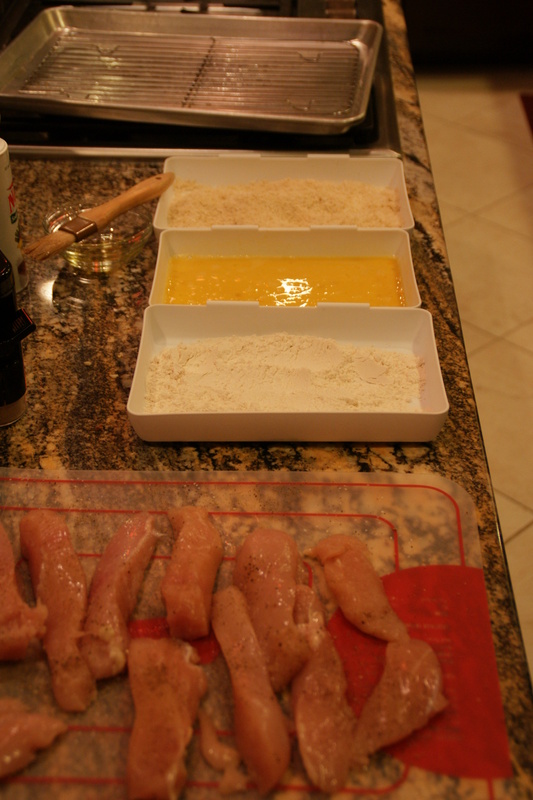 Make sure everything is lined up– chicken, dredge, pan. My chicken dredging assembly line! 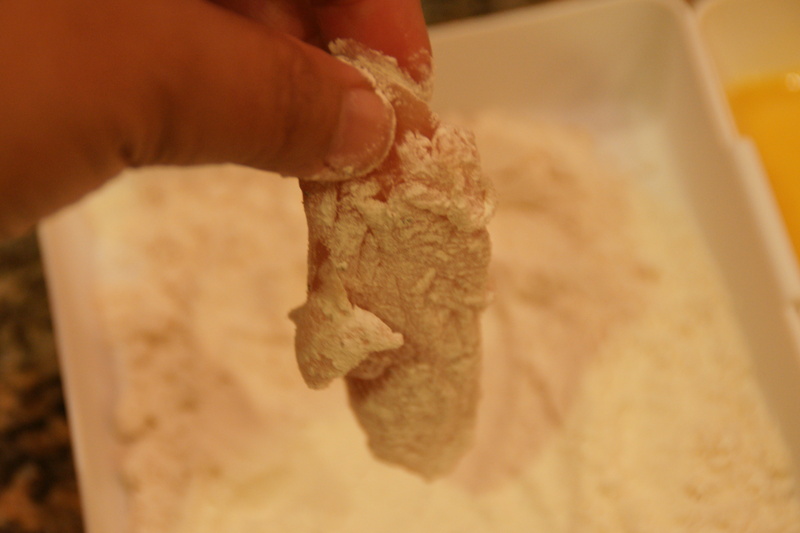 Take a strip of chicken and dip it into the flour pan, coating all sides. Shake off the excess. Cover all surfaces and shake well! 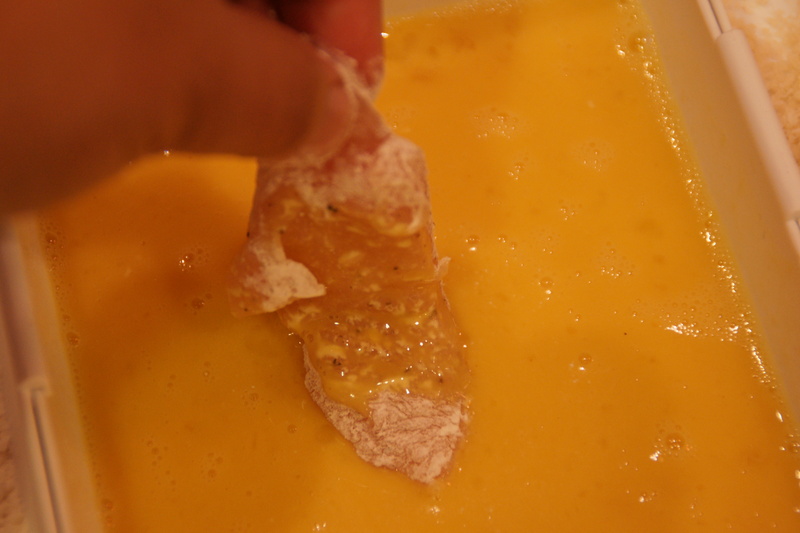 Then dip the flour-coated strip into the egg, again coating all sides (this gets messy). Let the excess egg drip off. 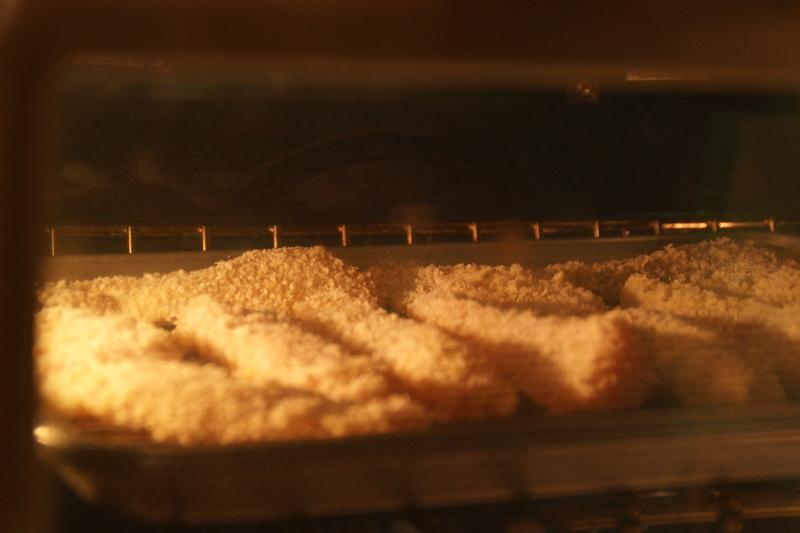 Finally dip the strip into the panko-parm mixture, coating well. 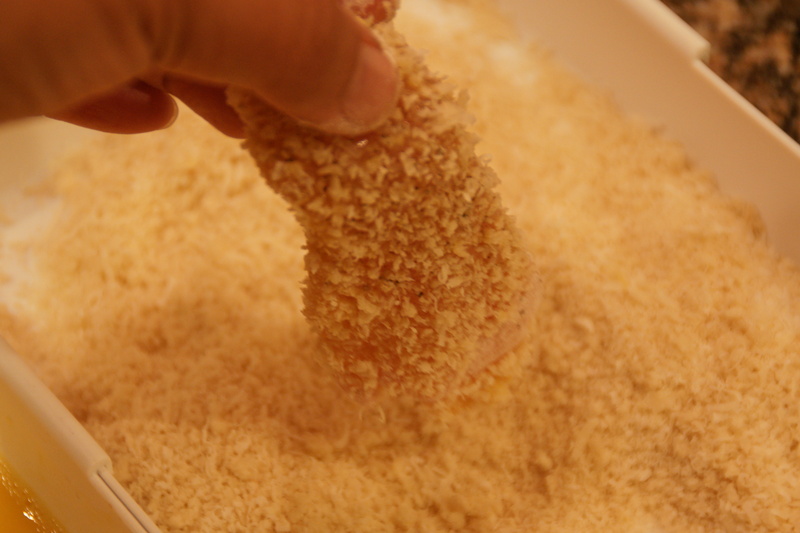 …and the egg makes the panko stick! Set strip on the cookie rack. When all the strips are done, bake in the preheated oven for 10 to 20 minutes. I bake these in the top third of my oven. I don’t usually let the strips brown as much as they would when fried because I don’t want to end up with dry chicken. Serve with your favorite dipping sauce– for us that’s mustard mixed with honey and regular ol’ ketchup! 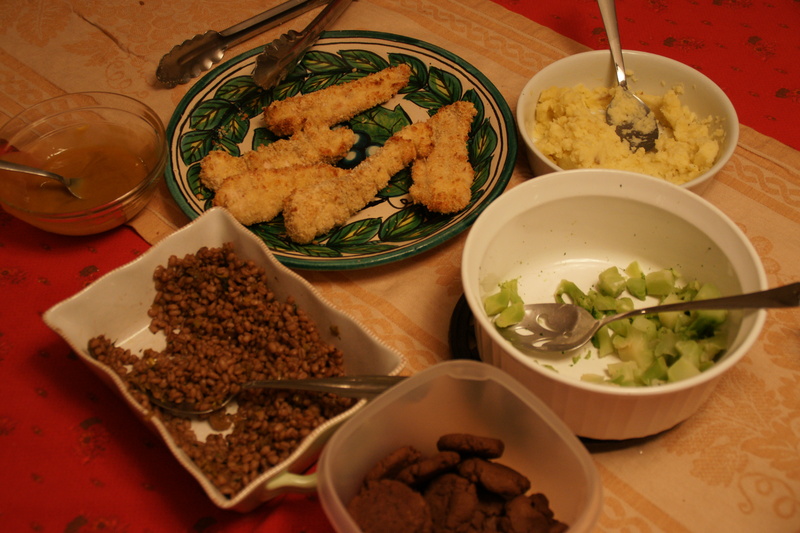 What was left after dinner (yep, we had the cookies)!